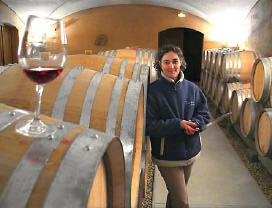 Anne functions both as vigneron and winemaker. The winery was formerly known as Francois Gros until Anne took over in 1988. According to Clive Coates, "Since 1993 Anne Gros has produced some of the finest wines in Burgundy." I would agree wholeheartedly with that statement and I would by her wines by the case if I could afford them. Holdings: Richebourg, Echezeaux, Clos de Vougeot, village Chambolle-Musigny and Vosne-Romanee. Old vines, some vineyards average 55 years. Even village vineyards are rubbing shoulders with premier and grand cru vineyards often high on the hill with northern exposure.